Australian summer is all about warm weather, holidays filled with adventure and of course, fun times by the water. In Yass Valley, there are plenty of hidden swimming spots where you can kick back, relax and enjoy the summertime while outdoors. And what’s best they’re all within an hour’s drive from Yass. For a safe and fun place to cool down head to one of the local swimming pools. 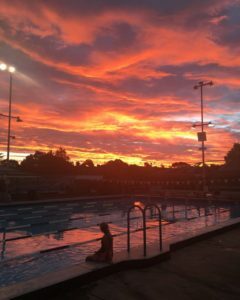 Both Yass and Binalong public swimming pools have lap and toddler pools, ensuring all ages and swimming abilities are catered for. Yass pool has a traditional kiosk offering refreshments. While Binalong pool has food and drinks available from vending machines to keep you fed and hydrated during your visit. Both provide standard amenities including toilets, showers, disabled facilities and lush grassed areas for picnics. Do your prefer canoeing, liloing, fishing or simply relaxing in cool, fresh water rivers? Then pack a picnic or BBQ supplies and head out to the Wee Jasper Reserves for a day of frolicking fun! Micalong Creek Reserve boasts a beautiful waterfall, cascading down into a deep, natural swimming hole, with water so fresh it takes your breath away! Swinging Bridge Reserve is ideal for a spot of fishing and the perfect spot to launch your canoe or lilo. Paddle or float along the Goodradigbee River to Billy Grace reserve, fun for the whole family! At Billy Grace reserve you will find toilets, showers, a playground, BBQ area and small kiosk offering the bare essentials. The office also issues three day fishing licenses. Take a tent or camper and spend a few days “off the grid” and enjoy quality time with loved ones. Do you crave watersports but prefer a few more creature comforts? Then one of the four tourist parks hugging the shores and rivers off Lake Burrinjuck are sure to satisfy all your needs. 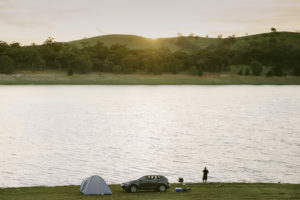 Only 15 mins from Yass, Good Hope Resort and Hume Park Tourist Park offer access to the dam for day visitors and overnight guests (fees apply for both). Or a little further afield Burrinjuck Waters Holiday Park and Lake Burrinjuck Leisure Resort offer the same access. All four resorts offer powered and unpowered camping sites and cabins. Take your fishing rod, canoe, lilo, or boat and head out for a day of skiing, knee boarding or biscuiting. Please remember, safety first – the dam is bursting with adventure seekers over the warmer months! If you like the ease of traditional swimming pools or prefer getting closer to nature by cooling off in pebble lined streams, Yass Valley has it all! 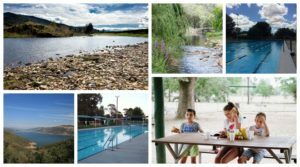 You won’t be disappointed when seeking the perfect place to cool down this summer right here in Yass Valley. When travelling to remote areas in Yass Valley please ensure you have adequate fuel for the return trip and any other essentials required as access to items and mobile reception may be limited.